We went to Mass last Sunday. Many people were shocked that we went because John was not even two days old. But I was feeling fine, and John just slept in his car seat the whole time. So we saw no need to skip Mass. I am SO glad we went to Mass. It was a very fruitful experience for me to partake in the celebration of Mass with my born son. My thoughts drifted to my love for John and how I would never want anything bad to happen to him. I feel very protective of John, and I am overwhelmed with the instinct to do anything to keep him safe from harm. This made me think of when I broke my back in 2006. I am sure those same protective feelings I have for John went rampant in my mom when she got the phone call that her "baby" daughter had broken her back while inner-tubing on Mount Baker. I want so much to keep John safe, but I know the time will come when he will be on his own, making his own decisions. 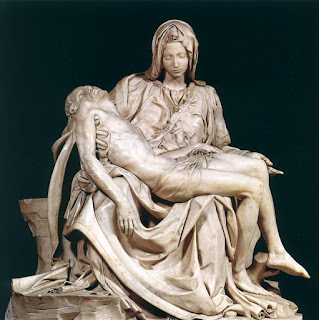 Then my thoughts drifted to our Blessed Mother Mary who not only let her Son suffer and die on the cross, but she watched it happen and kept her "cool." How obedient is Our Lady! I see her as my greatest example of good mothering and I hope to let John always do God's will, even if it is dangerous. I never want my protective nature to get in the way of God's plans. The most powerful part of the Mass was the Eucharistic prayer (as it should be!). As I mentioned in previous posts, my focal point for the birth was Christ saying "this is my body, given for you." I have been relating that to my own sacrifice of my body for John. But when I heard that phrase last Sunday, I thought about John living out this kind of love, and me letting him. I desire holiness for my Son more than anything. The clear message I received from God was, "He is not yours." Parents these days tend to view their children as being "theirs." I too have this inclination, but I am trying to view him more as a soul God has entrusted to me. He is my son, but more importantly, he is a child of God. I hope to parent John in a way that his Parent above would approve. You'll get that feeling of him not being yours much more when he's baptised. But it will be a relief when he is.